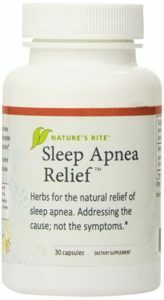 Nature’s Rite Sleep Apnea relief is a creation of Steve Frank, a former sleep apnea sufferer. It relieves the effects of sleep apnea so that you can sleep soundly and minimize snoring. Sleep apnea is a condition best known for causing a social discomfort: snoring. What most people do not take too seriously, but which is even more disconcerting, is the pauses in breath during sleep. For a few seconds (30 at most), your brain is deprived of oxygen. This could cause a number of conditions, death inclusive. The ingredients list on this product speak volumes of its ability. Thyme: This herb is known for awakening the respiratory abilities of the body. It opens up the blocked airways that cause sleep apnea. Chamomile: It relaxes the brain to help you sleep soundly. It is also used for calming the central nervous system to address insomnia from the base. Lobelia: The herb regulates one’s breathing. It addresses the amount of air sent up the airwaves and helps remove any blockage to create normal breathing patterns. Cramp bark: Natives have used this herb for centuries to help them breathe normally. They used it for flu, and to decongest noses. Now we use it to relieve sleep apnea. Meadowsweet: This herb, just like lobelia helps decongest your system to clear the airwaves. It makes it possible to breathe normally and to sleep soundly all night long. All these ingredients are organic and have no known side effects.